Not all our trails are inside the park. There are many trails along the shores of Fontana Lake, land owned by either the Tennessee Valley Authority (TVA) or the U.S. Forest Service. The multi-use trail system at Tsali, famous among mountain bikers, is but one example. Tsali is 15 miles west of Bryson City off Highway 28. Check out our “Think Outside the Gym” 2-day vacation itinerary that includes jogging in Deep Creek. Martin’s Gap Loop (Trails: Deep Creek to Martin’s Gap to Sunkota Ridge to Loop Trail to Indian Creek and back to Deep Creek) — Approximately 12 miles with 350 elevation gain, easy to moderate. Deep Creek Trail to Newfound Gap Road — 14.2 miles, easy to strenuous. For most this is a one-way hike, requiring a second vehicle at the end of the trail. Many choose to walk this trail “down” from Newfound Gap Road. Noland Divide Trail to Lonesome Pine Overlook — The 6.7 mile hike (in and out) is strenuous but the views are spectacular. The trailhead is just inside the Deep Creek park entrance, in the horse trailer parking area across from the Deep Creek campground. For the first three miles there’s an elevation gain of 2300 feet. At the crest of Beauregard Ridge the trail then narrows to a razorback with views of Bryson City, the Tuckasegee Valley and the Nantahala Mountains beyond. For the more adventurous, the Noland Divide Trail connects Deep Creek with Clingmans Dome Road. 11.2 miles one way. This too is a one-way hike for most. Noland Creek Trail — 6 miles in and out, easy. From a parking lot near the end of the Road to Nowhere, Noland Creek trail is an old service road with a gentle grade. Near the three-mile mark you’ll see the remnants of an old farm. Through the tunnel at the end of the ‘Road to Nowhere’, there’s the 3-mile Goldmine Loop Trail and the 42-mile Lakeshore Trail, which crosses Forney Creek, Hazel Creek and Eagle Creek on its way to Fontana Dam. ‘A Walk in the Woods’ — the book and movie have stirred increased interest in the Appalachian Trail. The Bryson City area has six segments of the AT that are perfect for weekend hikers, plus another 40-mile, 3-4 day backpacking segment. More information. The Appalachian Trail stretches through Swain County from south of the Nantahala Gorge; across Fontana Dam and then follows the highest ridges of the Great Smoky Mountains National Park past Clingmans Dome and Newfound Gap on its way to Maine. You can access the trail at Wesser in the Nantahala Gorge, Fontana Dam, Newfound Gap, and at Clingmans Dome. A popular section of the AT is from Newfound Gap to Charlie’s Bunion. The 8-mile-round-trip hike passes through a spruce and fir forest with spectacular vistas. The hike as an elevation gain of 1640 feet and is considered strenuous. Clingmans Dome to Andrews Bald is a moderate 3.5 mile hike (in and out) with an elevation gain of 899 feet. Popular for its spectacular views, Andrews Bald is accessed via the Forney Ridge Trail, which is located at the far end of the Clingmans Dome parking lot. Kephart Prong Trail — 4.2 miles in and out, the trailhead is on Newfound Gap Road (US 441) about 7 miles north of the Oconaluftee Visitor Center. With an elevation gain of 955 feet, the trail is considered moderate. In the first quarter mile, you’ll see remnants of the depression era Civilian Conservation Corps (CCC) camp. Most hikers turn around at mile 2.1 at the Kephart camping shelter. Mingus Creek Trail — An in and out hike, 6 miles in length; easy to moderate with an elevation gain of 1515 feet. Trail begins at the Mingus Mill parking lot just north of the Oconaluftee Visitor Center. The lower two miles include Mingus Mill, remnants of CCC camp #4484, and if you take the right fork at Mile 1.25, an old road to a historic cemetery. Self-Guided Nature Trails — The National Park has several self-guided nature trails in Swain County: The half-mile Spruce-Fir walk begins on Clingmans Dome Road and introduces you to the conifer forests that grow only on the high peaks this far south in the eastern U.S. Smokemont — the 0.75 mile walk begins at Smokemont Campground and shows examples of human impact on the land, such as logging and farming. Balsam Mountain — the 0.75 mile walk begins at Balsam Mountain Campground and shows how nature has reclaimed a once-logged northern hardwood forest. Want to hike with your dog? Bigelow's Botanical Excursions offers guided walks and hikes with an emphasis on the wildflowers, plants, and ecology of the Southern Appalachian Mountains. Hikes available for all activity levels and throughout the seasons. Guided hikes at Carolina Bound Adventures specialize with individuals and families new to hiking that want to get out there, but want a guided adventure and all equipment provided. Come hike with us! 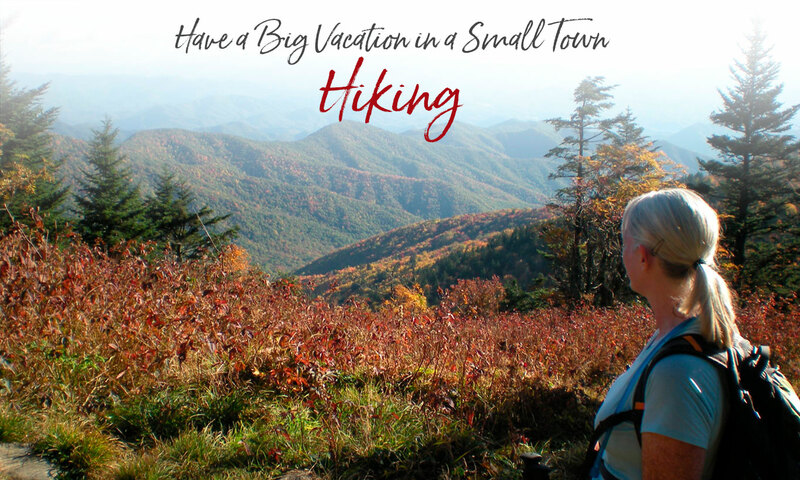 Enjoy the beauty of the Great Smoky Mountain National Park while on guided hikes with one of our knowledgeable and friendly guides. Of course you can hike any trail in the park on your own... or you can go with an experienced guide and hike safely with confidence! Dogs are not allowed on the Deep Creek trails (even on a leash), but here are some pet-friendly alternative hikes. Oconaluftee River Trail – One of two walking paths in the National Park where visitors can walk dogs and bicycle. (The other is the Gatlinburg trail.) Pets and bicycles are prohibited on all other park trails. The trail travels 1.5 miles one-way from the Oconaluftee Visitor Center’s Mountain Farm Museum to the outskirts of the city of Cherokee, NC. It is relatively flat, but does have a few small hills. The trail runs through the forest along side the Oconaluftee River and offers beautiful views of the river. Island Park – In downtown Bryson City. Take Everett Street to Bryson Street. Cross the bridge over to the park at the end of Bryson Street. Recreation Park – There is a walking trail in the Recreation Park on West Deep Creek Road just outside of downtown Bryson City. Take Everett Street to Depot Street. Then take West Deep Creek Road to the Park. Nantahala National Forest – Trails in the National Forest are pet friendly. One paved trail is the Nantahala River Bike Trail TR368. A nice flat trail that begins at the rafting launch site (Off Hwy 74, south of the NOC, turn left on Wayah Road). Park at the launch site and take the bridge across the river. The trail follows the river for about 1.5 miles. Check out our Dog Friendly Vacation Ideas in Bryson City. Quiet walks and hiking trails all along the Parkway. Local favorites are Waterrock Knob and Graveyard Fields. Take a break from watching the Elk herds and enjoy one of several hikes to see historic structures. This magnificent 3800-acre forest is a remnant of an old growth cove hardwood forest. Enormous yellow poplar, hemlock, basswood, beech and other trees tower over the two loop trails. Twelve miles northwest of Robbinsville, NC, off Hwy 143. Four singletrack trails that hikers share with mountain bikers and horseback riders (alternate days). Beautiful views of Fontana Lake from Left Loop. Named for its sheer white cliffs, Whiteside Mountain rises above the Nantahala National Forest near Highlands, NC. A two-mile loop trail leads to the 4,930-foot summit. From March thru September, each month presents new opportunities to view wildflowers in the Smokies. Looking for a particular variety? Our Smoky Mountains Wildflower Blooming Calendar (pdf) can help you plan your hike. For a complete description of every trail in the Great Smoky Mountains National Park, we recommend: Hiking Trails of the Smokies by the Great Smoky Mountains Association. This book is generally available at area bookstores and outfitters. Milestone Press – “Hiking the Carolina Mountains” and “Backpacking Overnights” guidebooks; Tsali Trail Map (waterproof and tear-resistant); and the app: “Great Hikes of the Southern Appalachians” – great information from local publisher. Maps of Tsali Trails and Cherokee Fire Mountain Trails are available at Tsali Cycles on Slope Street in downtown Bryson City. Hiking in the Smokys is a website providing detailed information on more than 70 trails throughout Great Smoky Mountains National Park. This site gives you access to trail descriptions and key features, pictures, trail length, difficulty ratings, trail maps, elevation profiles. A Hiker’s Journal — Sharon McCarthy recently completed her goal of hiking every mile of trails on the Great Smoky Mountains National Park in just one year. She describes the experience in her excellent online journal. Lots of photos.